When I got accepted for a FAM trip (familiarization) with the fabulous Intrepid Travel Group to Chile and Argentina, I was beyond excited. I had applied for the trip, but it was full. A couple of months later, a spot opened up, I applied again and was given the opportunity to attend. I knew nothing at all about Chile except for it’s location on the map, that it was a Spanish speaking country and that it lays claim to a portion of Patagonia, with the other half being in Argentina. In mentioning Chile to people, I was told repeatedly that I must not miss the chance to see Valparaiso for it’s colorful houses, unique history and ancient funiculars (or ascencores). I did minimal research, but knew immediately that it was a place that I wanted to visit. I considered going straight to Valparaiso from the airport on a local bus, but I thought it would be a bit much for my first day in the country and I’d be tired from the flight. So, I booked a hotel in Santiago and made the decision to not decide until I arrived. I’m really good at making decisions not to decide by the way … but at least once I’ve decided not to decide until a certain point I can move it off my plate, out of my head and get other things done! Once I was settled into my hotel in Santiago, I walked to the central market and then to Plaza des armas where there was supposed to be an info centre. Sadly, when I finally found it (at about 3:30pm Friday afternoon), it was closed. So, I headed back to the central market where I had noticed several tour companies. Sure enough a gentleman speaking excellent English nabbed me out of a line up at one of the tourist offices and took me to a spot where I would get ‘THE BEST PRICE’. I went with him because it was still in the central market, he was friendly and I hoped that I wouldn’t have to wait in line to speak with someone. And, I didn’t have to wait at all. However, the girl was going to run (literally) to go get someone who could speak English. Being brave, I stopped her and told her if she spoke slowly, that I would understand most of what she had to say in Spanish. She took me through a short slideshow of the Vino & Valpo tour that they offered. It was a group tour on a bus and they spent very little time actually in Valparaiso which was the main point in me taking the tour. I asked her if they offered the tour in English the next day and she said advised that it would be only a Spanish guide. I decided that I didn’t understand enough Spanish to want to sit on a bus all day with only Spanish as I felt that I wouldn’t get to take many pictures due to the schedule and I also wouldn’t understand the history, so it seemed to be a waste. Another staff member briefly explained to me that I could take a couple of subways and then buses to get there and explore on my own. (Which now, I’m glad I didn’t) Although I’m sure I could have managed, I somehow didn’t feel like using the brain power to navigate all of the transit situations needed to get me there. As a last resort, I asked if any other companies offered the tours in English. They were kind enough to tell me yes, that a company called Turistik offers English tours, but they are much more expensive. 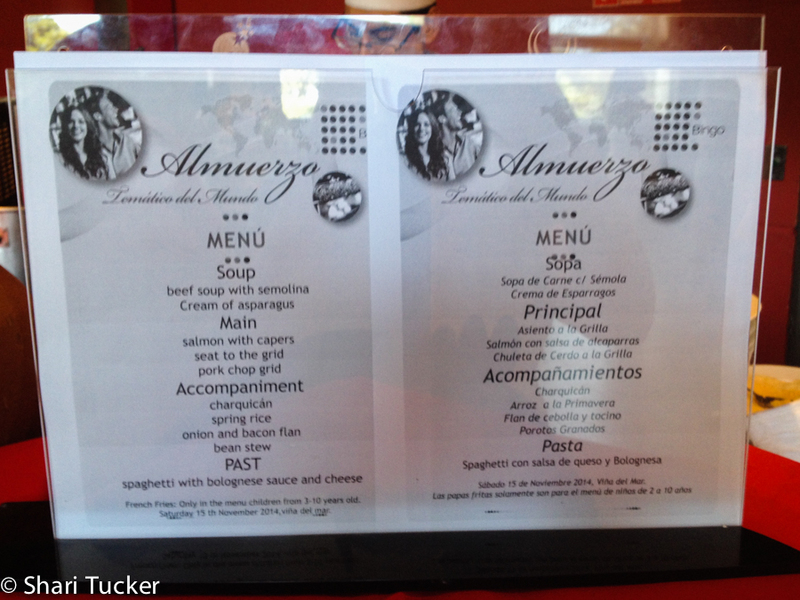 I thanked them for their time, and went on my way knowing that a busy Spanish speaking tour was not what I wanted. I happened across the Turistik office on my way out of the central market and was immediately greeted by three young, enthusiastic, English speaking locals. I had a chat with them about their Vino & Valpo tour and decided it was a great compromise as the guide would explain in Spanish and English, we would visit Vino del Mar and Valparaiso and, I wouldn’t have to worry about any logistics because they would pick me up and drop me off at the market. On Saturday, November 15th I arrived at the office at 8:15am and was picked up by a big Turistik bus with leather seats and air conditioning. We drove around the centre of the city picking up other guests and then made our way to a central gathering area where we were shown which bus to get on for our specific tours. Once on the bus, I sat with a lovely lady named Ana from Madrid, Spain. And we each practiced our second language with each other. It was a great way to pass the time on the two hour bus ride. Along the way, our guide, Felipe explained about the climate and Chile’s landscape. It was very interesting. Usually he would explain in Spanish and I would understand about 1/4 to 1/2 of what he was saying and then he would explain in English and I’d understand much more clearly. As we drove through a mountain tunnel, he explained that Chile has two prominent mountain ranges, the Andes and the coastal range. The Andes run across the country from east to west (or most of the way). The coastal mountain range splits the country from north to south. Hmmm … I had no idea! 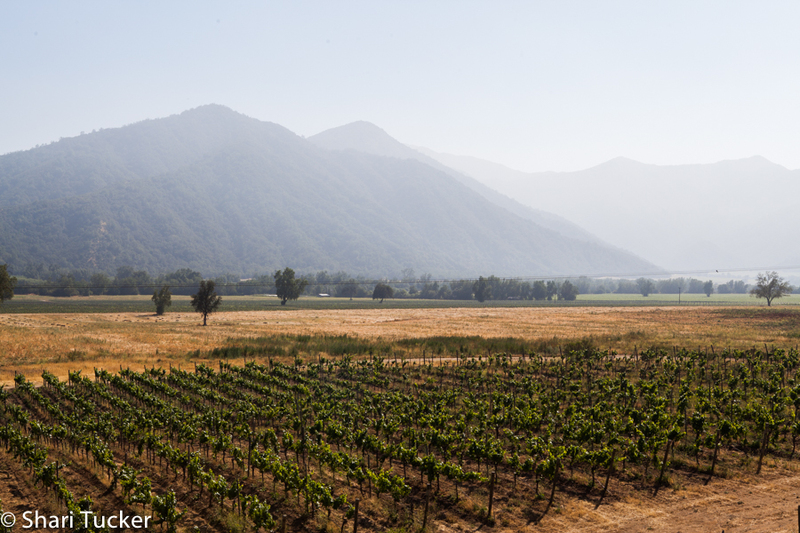 On the east side of the coastal mountains, you’ll find Santiago which is incredibly hot, dry and dusty. On the west side of the coastal mountains (where we were headed) it would be humid, green and a bit chilly. Of course, none of us really believed it would be cold. Afterall, we were in the south and headed to Vino del Mar to a beach on the Pacific Ocean. As we exited the tunnel on the west side of the mountain range, you could instantly see a difference in the landscape. Lush green fields and mountains covered in trees. Vineyards everywhere with green leaves. And, the windows on the bus started to fog up. What a difference! As we circled our way down the big mountain toward the Pacific Ocean, we were constantly wiping the condensation from the windows in order to be able to see out. Despite the grey sky and thick fog hanging in the air over the grey ocean, you could see Valparaiso off to the left and Vina del Mar to the right. Coming down the S shaped curve, navigating to the bottom of the mountain gave you views in either direction until you reached the flat area close to the water. We visited Vina del Mar first. Along the way our guide pointed out a few of the well-known buildings of the relatively young city and then we stopped for a walk around Palacio Vergara. 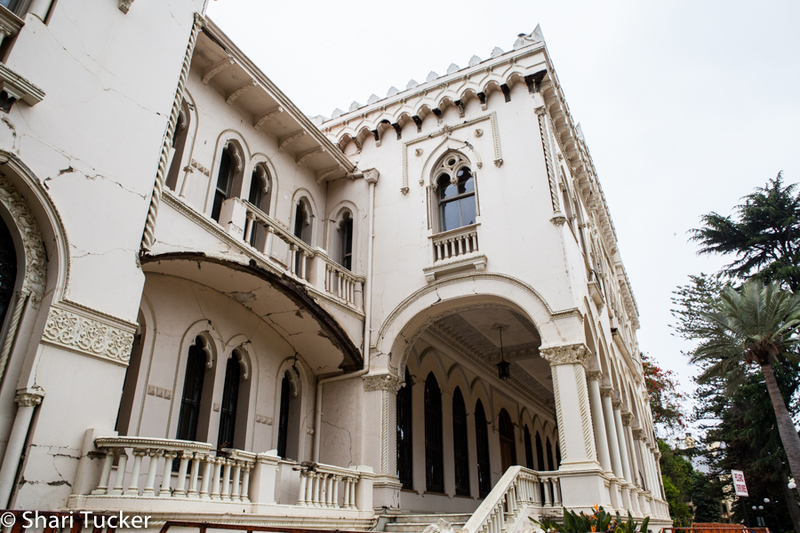 The palace has been completely rebuilt once after an earthquake devastated it hundreds of years ago. More recently, after being rebuilt, it has stood strong through several major earthquakes until 2010 when it was heavily damaged. The restoration will begin in 2015. It was interesting to hear Felipe speak about the palace and the family who lived there with such passion. Obviously proud to be Chilean with a love for these two interconnected cities and a yearning to keep the cities’ history alive. A short walk through the park brings you to Vina del Mar’s amphitheatre which is home to the end of summer International Song festival in February of each year. 15 000 people gather at the amphitheatre for a week full of music appreciation for all ages, big international performers such Rod Stewart and Elton John, along with Chilean celebrities and nightly comedy shows. We had a short stop at the well-known white sandy beach that drops off to the chilly Pacific ocean. 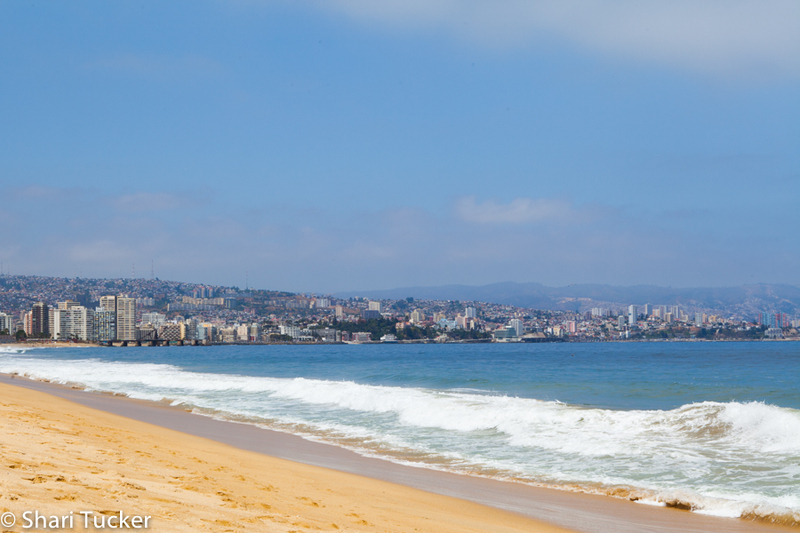 It was beautiful to see the sand and ocean waves with the city of Vina del Mar and Valparaiso in the background. I didn’t waste a minute getting to the water to dip my toes in the cold Pacific! AHHHH. Refreshing! I wouldn’t want to go swimming in it though. It was a bit chilly, even for this Canadian girl! 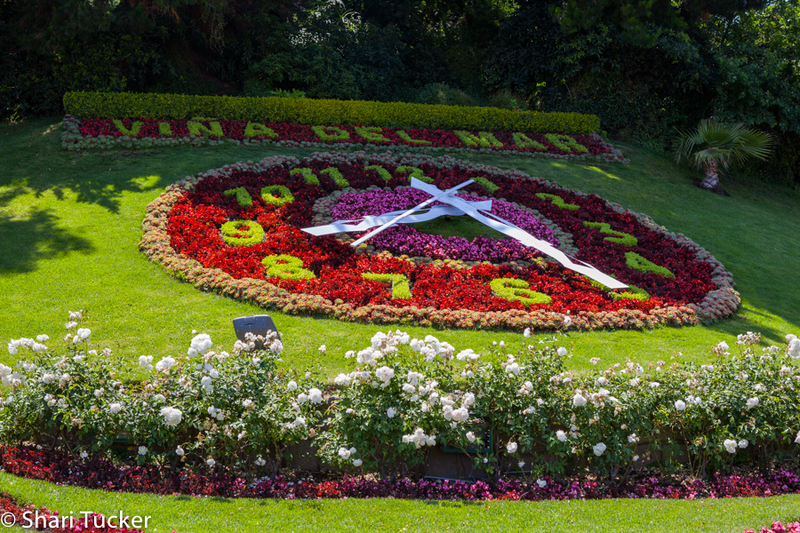 After a quick obligatory stop at the flower clock that was gifted to Vina del Mar from Switzerland, our guide explained that we would be stopping for lunch, but we would only have one hour in order to stay on schedule. The company had arranged for us to eat at the Municipal Casino where there was a buffet lunch. The guide made it quite clear that the lunch was optional and we were not required to eat at that location, but we could if we wanted. Despite the high end price, I decided to eat with the group. Sadly, I was quite disappointed in the food that cost me close to $30 USD. It was indeed a buffet and there were quite a few options, but none of them were fantastic. There were a variety of breads, cheeses, olives and salads along with several types of hot, fresh meat from beef to pork, chicken to salmon with capers. The best part of the buffet was the spread of approximately 10 different desserts. I’m sure I tried at least four of them and they were all delicious! Next up, the part that I had been waiting for, Valparaiso!